Study report "The New Trends in Asian Urban Lifestyle"
Hailing the ASEAN economic integration in ’15, Bangkok is expected to further develop both economically and culturally as a hub city with improving infrastructure. Under such circumstances, the life environment of Bangkok is drastically changing to bring forth the urban citizens’ new, higher-quality needs. A favorable cycle has evolved that the needs transform more richly the lifestyle of the wealthy and middle classes in Bangkok. Based on such situation, the report reviews the urban development of Bangkok, and shows the new lifestyle and trend of Bangkok citizens such as housing trend, change of shopping style and movement toward modern trade, change of diet, and their confidence in Japonism. Also the report reconsiders from different viewpoint the nature of the Thai people who quickly heat up and cool down easily, and the issues of low fertility and aging that have a significant effect on future lifestyle. Furthermore, the problems of the Thai stratified society and the Thai people’s harmonious mentality brought about by Buddhism are examined along with the future lifestyle of Bangkok wealthy and middle classes who play the role of engine for more comfortable urban life. ・In 1999, after completing marketing degree of commercial science in Chulalongkorn University, he joined SCG Group. He got his master degree (in 2005) and doctor degree (in 2008) in Commerce from Hitotsubashi University. He became a lecturer of the department of commercial science at Chulalongkorn University in 2008 and an assistant professor of the university in 2012. 1979	B.S.Mathematical Statistics, Chulalongkorn University, Thailand. 1982 M.S. Biostatistics, Mahidol University, Thailand. 1991 M.S. Actuarial Science University of Nebraska at Lincoln, USA. 1995 Ph.D. Statistics and Actuarial Science, University of Waterloo, Canada. 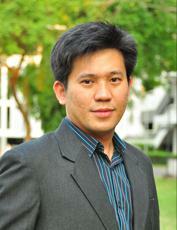 2005 – 2008	Deputy Dean, College of Population Studies,Chulalongkorn University, Thailand. 1996- 1999	Chulalongkorn University, Thailand.